TW LogStackers were featured in June issue of ProMagazine.se. The article covered a six-page story of the development and evolution of TW LogStackers. ProMagazine.se is published by Ammattilehti in Finland and it is targeted to the Swedish market. 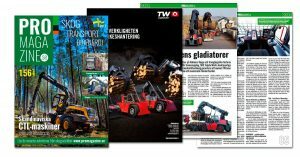 The magazine covers topics of timber handling, forest industry transportation and bioenergy.